Recent Meditations at Humankind Fair Trade showing May 2nd through May 31st, with and Opening Reception for Art After Dark on Friday, May 4th, from 6-9pm. Located at 982 Monterey St, San Luis Obispo, CA 93401. For more info, please visit the Humankind Website. Recent Work at Nautical Bean show extended through May 31st, located at 11560 Los Osos Valley Road, San Luis Obispo, Ca. For business hours and more info please visit the Nautical Bean Website. Recent Mixed Media at Buttercup Cafe & Bakery, Morro Bay, Ca. Please join me for an intimate look at process, product and personality. This is a great opportunity to see artwork in the context of it's stylistic and technical development, personal narratives and aesthetic influences. Come get a glimpse behind the scenes into the working studio, have some refreshments, and find yourself or a loved one a beautiful new piece of art! 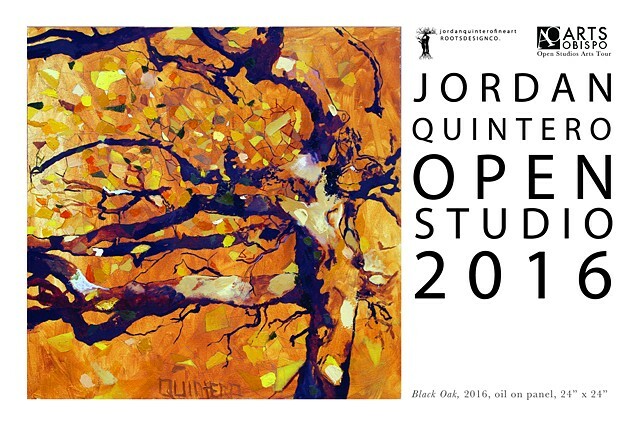 You can follow on Instagram and like on Facebook @jordanquinterofineart to keep up on the latest news. For my first SLO "Art After Dark" showing I've been focusing on creating a series of small mixed media drawings on wood that focus on the socio-economic realities of living in one of the most scenically impressive places in the world. The Central California Coast, with it's rich agricultural resources, Mediterranean climate, and natural beauty, is a constant source of wonder and inspiration to me. Watching (and participating in, as an architectural designer) it's development to accommodate higher and higher population density has been a really interesting and challenging experience. For this show I have brought together a collection of small works exploring the connections between human beings--their psychic and energetic as well as physical forms--within the larger environmental contexts of our existence. 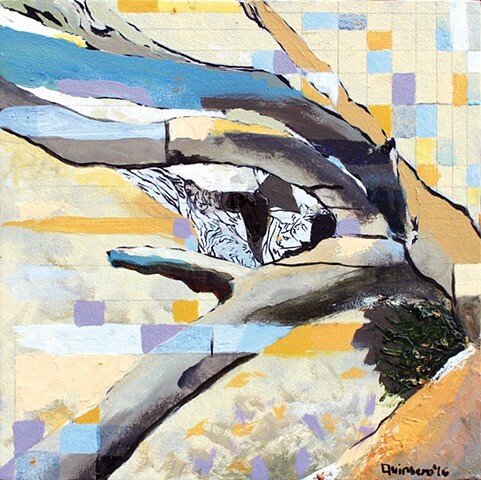 I combine abstraction and representational source images to create a dialogue between the need for housing development and human social connection, and the inherent aesthetic satisfaction of the wild and open landscapes that still lie within short drives of the urban centers on the coast here. They are hybrid works--part imagination and part observation, part engagement and part detachment--products of a meditative process that I am compelled to maintain in order to remain functional in a society and reality that seems to become stranger and stranger as technology, mediation and consumption continue to encroach on and define the experiences of our daily lives. My piece A Quit Cataclysm In White has been awarded a juror's choice award in this beautiful group show presented by the SLO Painter's Group. Upstairs in the McMeen Gallery. Call for available viewing time. Really excited to present my first solo show in Los Angeles! Showing painting, drawing and mixed media installation work about the excruciating intimacy of being alive. Honored to have some recent paintings showing at "Lake Tahoes Best art Gallery" for their summer shows. These guys throw a great party, make sure to stop by if you're in the area. I have a selection of recent work hanging at this exciting new co-op gallery space in Old-town Nipomo, Ca. Located at 136 N. Thomson Ave # B, Nipomo, Ca, 93444, you can head over to their FB Page for gallery hours and more info. Will have a selection of recent work hanging for the next several months as part of San Luis Obispo Museum of Art 's "Art About Town" program. You can stop by Mon-Fri, 9-5pm. Visit SLOMA website for more info. View exhibit on my blog here. Year six. Last one. Showing at Branches and painting live. What a long strange trip it's been. Tickets are almost sold out, grab yours here. "The excruciating intimacy of being alive..."
Lickety Split Bakery, 1544 West Grand Avenue, Grover Beach from May 1st - June 1st, There will be an opening on Friday, May 12th, from 6-8pm, with music and live painting. !!! !October 8th & 9th + 15th & 16th!!!! 10am-5pm. 140 Cornerstone Lane, Arroyo Grande, Ca, 93420. Please RSVP on FB here. ArtsObispo Open Studios Art Tour. October 8,9th 15, &16th at Ca'Nanni Bella, Arroyo Grande. The Months of August-October @ Black Hammer Brewing Co.
My work will continue to hang in the tasting room and vacation rental of this boutique family-owned vineyard and winery on the storied West Side of Paso Robles through 2016. New mixed media and paintings in beautiful tasting room in historic downtown Templeton, CA, my home town. Opening reception will feature locally harvested and produced appetizers compliments of Carmichael Environmental and live musical performance by James Rivers. Admission is Free. Show hangs through Nov 2nd. I'm honored to be showing a selection of mixed media artwork at this gorgeous location nestled in the heart of the West Paso Robles Wine Country. They have great live music, make and pour beautiful wines, and offer vacation rentals of their beautiful chateau (which also has my work hanging in it!) nestled in the vines. This charming little cafe in the historic rail station neighborhood in SLO features beautiful farm-to-table fare and free trade, single-origin coffees seven days a week. Check out their website here or find them on facebook here. You can also see pictures of the show on my blog, here. I'll be hanging a selection of recent paintings in the foyer of this beautiful community theatre. Visit their website here to see what shows will be going on! Opening reception Friday, October 9th, 6-9pm. View Clavo Cellars website here. Showing a new oil painting series focused on my abstracted/mythologized take on Central Coast landscapes, opens Nov 17th. Oct 3rd–Nov 11th, Jellyfish Gallery, 1286 Folsom St, San Francisco, Ca. Recent painting and mixed media work. Gallery hours by appoinmtent only, please contact Jellyfish Gallery Curator Kate Cleaves via email, kate@katecleaves.com, to schedule a viewing. 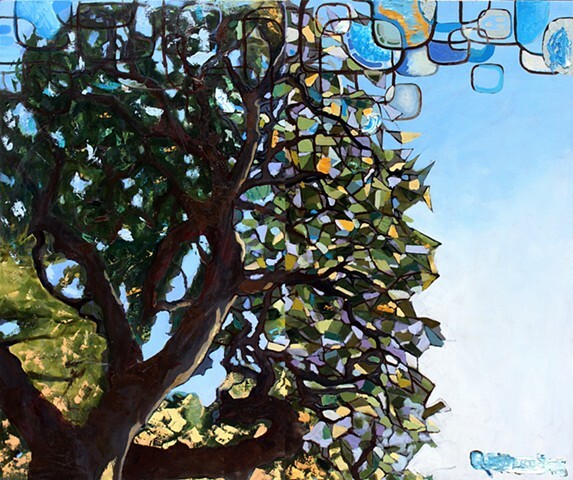 Titled "Trying To Be A Tree", curated by Kate A. Cleaves, the exhibition runs through the month of October and will feature painting, drawing, mixed media and subtle installation elements to transform the Jellyfish Gallery into and wondrous nexus of nature, art, color, pattern and myth. This exhibtion explores the motif of human/plant hybridity as a way of examining the idea of consciousness evolving, if not a conscious evolution. // In my work I've always drawn extensively on mythological tropes, though I feel that I've given them a fresh stylistic and conceptual rinse vis-à-vis the millenial anxiety of this generation, and the eschatological promise/premises of our increasingly surreal and dystopian contemporary vistas. // The trees were our first gods, and in this work, and in this time, I feel we may yet have much to learn from them. // In this way, it feels important to look at the old stories, our psychic and spiritual roots, to search there for what psychologists might call the Self, (what is left of the soul (what the soul has become)), and to search there also for meaning and beauty, truth, understanding, possible ways forward. To me, it has been one of the most important things for a long time now. Curated by Neal Breton and presented by Studios on the Park and Gallery Fiasco, this exciting group show brings together 30 up and coming California Artists in the heart of Central Coast Wine Country. Go check out what other awesome stuff they've got! This dynamic group show brings together some of the brightest talents in the post-vsionary West Coast art landscape for a grand re-launching of the iconic Jellyfish Gallery venue in San Francisco's Soma district (bonus: easiest parking in the city). While I will regretfully not be able to be in attendance for the opening, I am showing several works addressing the "Portals" theme that span almost a decade's worth of art making, as well as a selection of gicleé prints, so I will have a presence in the exhbition even in absentia. 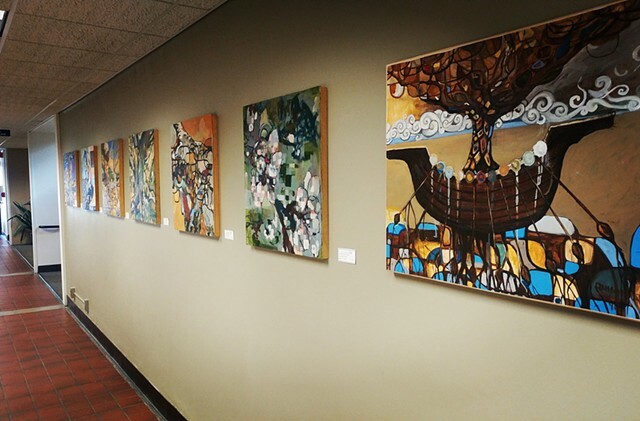 Through April 31st, contact Kate Cleaves for gallery hours, or to arrange a private viewing. For any of you on the Central Coast, I'd be delighted if you could come and join me for hors d'oeuvres, music and libations next Friday night at this little pearl of a space in Grover Beach. I have a nice selection of the recent TTBAT paintings hung in the shop and it looks pretty sharp, if I do say so myself. I'll also have some (affordable) prints and drawings on hand, so I hope to see you there. I'll be able to posse up with my friends and get out to Live Oak for the third installment of this magical event. While not handling curation duties for Branches Mobile Gallery this year, I will have a selection of the recent Organitecture mixed media work showing with them and also be painting live throughout the weekend. Only a few tickets left so hury hury if you'd like to come be part of the fun! Don't forget that you can also find my art on Facebook, head over to Jordan Quintero Fine Art and give it a "like" by clicking here. I'l be hanging a collection of recent mixed media artworks from my newest sub-series, "Organitecture", alongside the work of photographer Robbin Green at Oakland's The Uptown Nightclub, August 1st-Sept 30th. All works will be available for purchase on my new Etsy page during the duration of the exhibition, and I'll be periodically posting the new pieces on my Facebook Page during the show, so make sure to head over and give it a "like". I wont be adding the work to the website until after the show comes down and the series is a bit more fleshed out out, so please check out the links above, or, better yet, go see the show! Augst 1st -Sept. 30th, receptions hosted on August 2nd and Sept 4th in conjunction with the monthly First Fridays Art Murmur. With Noah Boyes and Isaac Blackwood. BMG curated a show for the Lucidity Ticket Release Party at Soho, 1221 State St. Suite 205, in downtown Santa Barbara, Ca. The show will be up all month. I'm showing a few large pieces. See all the event info and rsvp on the facebook invite page here. I had several pieces jurried into Naming Ceremony Gallerie's on line exhibition "Storybook Fragments", including text written by Maya Dobjensky for the show. Check it out here. Month of Feb, Bello Mundo, 980 Monterey Street, San Luis Obispo, Ca. 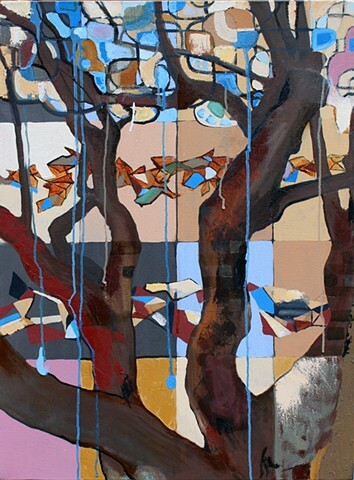 Recent paintings from the series "Trying to be a Tree". Opening reception in conjunction with the monthly "Art After Dark" art walk, Friday, Feb 1st, 6-9pm. Rsvp and see more info on facebook invite page here. Opening Reception Nov 1st, 6-10:30 pm, RSVP on Facebook Event Page Here. Opening Friday, Dec 7th, 7-10pm, in conjunction with SLO Art Council's monthly Art After Dark event. This monthly blow-out at 1015 Folsom features the best in up and coming creative talent and I am excited to be part of their July showcase. Check out the online flier here,and please help me meet my goal of selling twenty tickets through my profile page on the RAW website here. Art Party!